Back when I revealed all of my opinions about Whole30, I talked about how frustrating it was that some of my favorite healthy foods were off limits, and how I prefer a “plant based” diet. 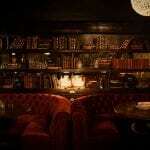 Since then, I’ve gone back to eating the way I like to eat – indulging in pasta on a cozy Sunday night (Yes, last night! Check insta stories ? ), incorporating quinoa and legumes back into my routine, and skipping the meat when I just don’t feel like it. That being said, a bunch of you have asked specifically about what I actually eat – what “plant based” meals do I incorporate into my day/week? 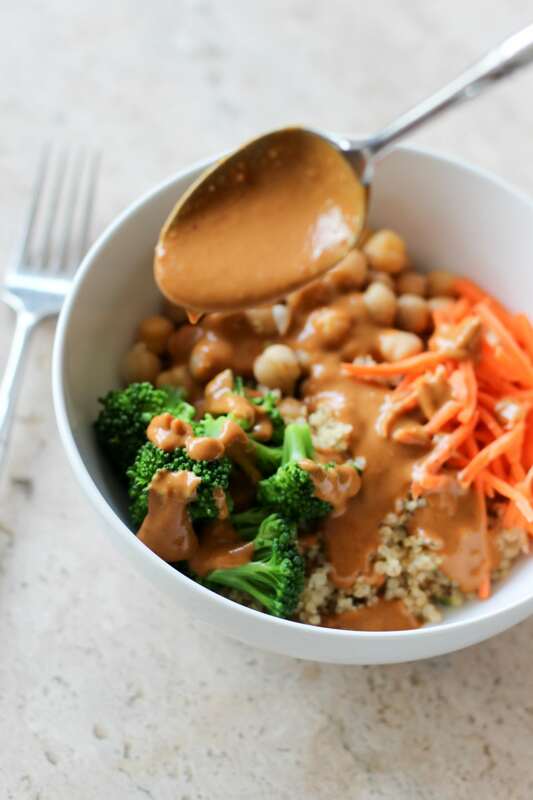 Well, this Quinoa Bowl with Peanut Sauce is a perfect example! 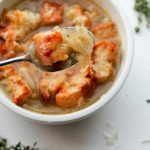 It’s super easy to throw together, and there’s a ton of protein and fiber in there to keep you full. Plus, it’s delicious. That sauce tho! But my favorite part? It’s PRACTICAL. If you’re too busy to cook every night, I hear you loud and clear. But here’s the thing, we all have the time to whip up a batch of quinoa when we’re home one night. Store it the fridge. The next night, maybe blanch some broccoli and put that in the fridge with a bag of shredded carrots. Keep a can of chickpeas in your pantry alongside your peanut butter. 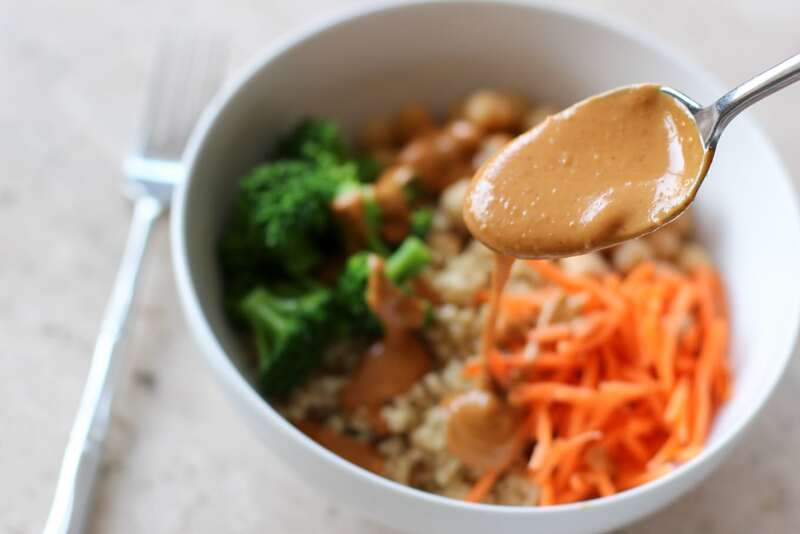 And when you’re ready to eat, quickly whisk together a batch of homemade peanut sauce. I also like to keep all of these leftover elements separate, so that everything stays fresh all week long. Dinner, lunch, snack – healthy eating just got a lot easier, right? I personally like blanched broccoli with this dish, but you could also roast them for a little extra crunch. Next time I make it, I want to try adding string beans, too! And speaking of trying something else next time, you can definitely have fun and get creative with different veggies and proteins. Maybe swap the chickpeas for edamame? Throw some tomatoes in! Add chicken or tofu or ground turkey! The possibilities are endless. 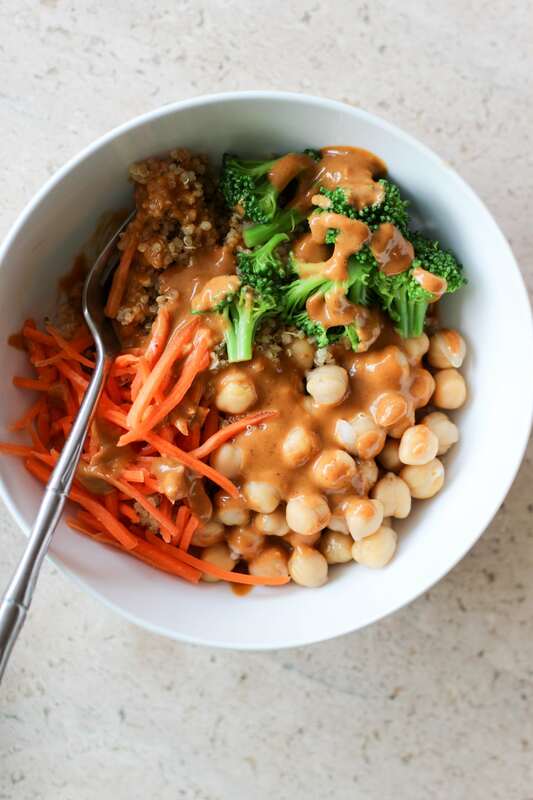 Hot Tip: If you’re making this quinoa bowl with peanut sauce for a Meatless Monday but you want a little more fat, add some sliced avocado on top. So. Good. But the real star of this dish is the sauce… obviously. This particular one is a riff on the peanut sauce I made with Zoodles and Chicken last year. 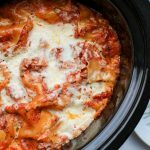 I found myself craving it, even when I didn’t have zucchini around!! 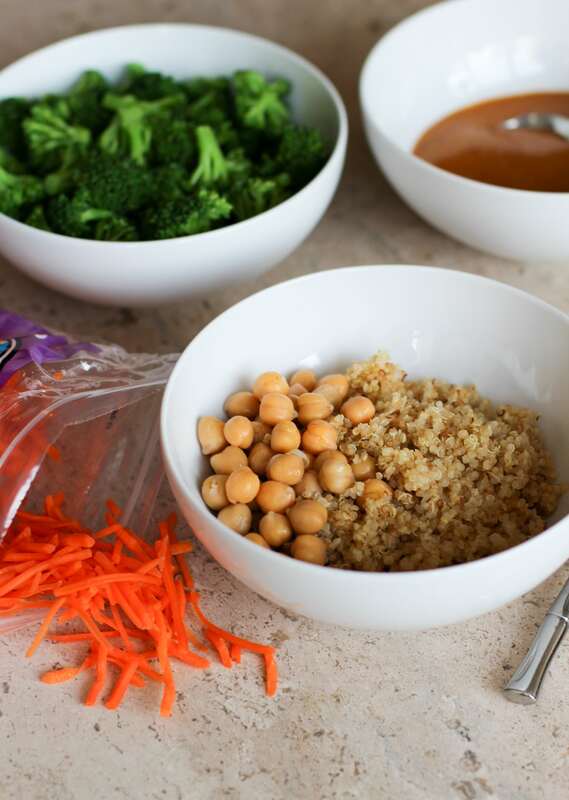 Turns out, it’s delicious with all kinds of veggies, which makes it perfect for this bowl! Also, if the sauce is too thick for you, simply add another tablespoon of water until it’s the right consistency. There’s a ton of flavor in there, so a little bit of extra water won’t change that much ? Seriously, this is so freaking good. Such a good example of healthy, plant based eating that is still delicious, flavorful, and satisfying. Ohhh yeaaaaa. 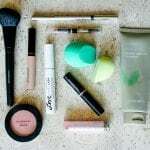 Let me know if you try it out! Cook your quinoa according to the package's instructions. 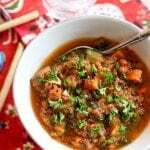 Usually, you will bring 1 cup of quinoa and 2 cups of water to a boil. 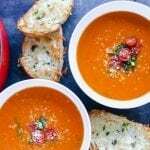 Reduce the heat to low, cover, and cook for 15-20 minutes. Once it's done cooking, fluff with a fork. While the quinoa is cooking, rinse and chop up your broccoli into bite sized pieces. 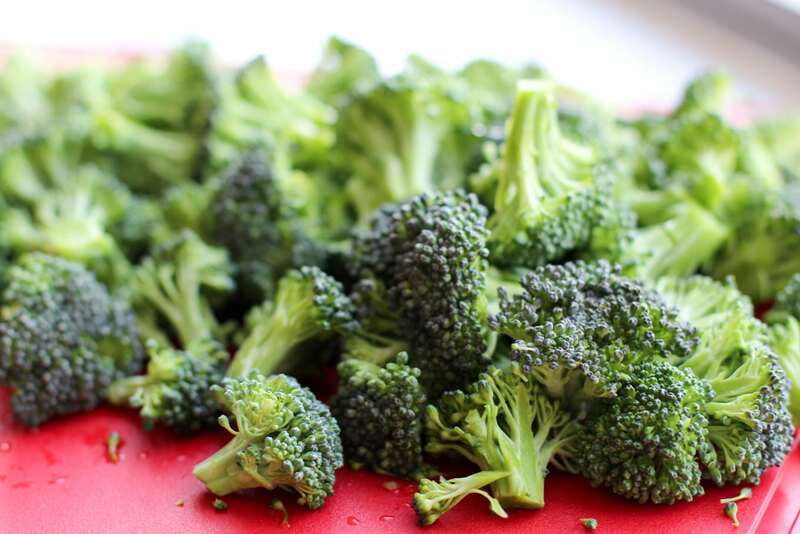 Bring a pot of water to a boil, season with salt, and add your broccoli. Cook for about 2 minutes, or until the broccoli is fork tender. Drain and rinse with cold water. Set aside. In a bowl, combine soy sauce, natural peanut butter, hoisin sauce, water, sriracha and lime. Whisk until the peanut butter is completely smooth. If your peanut butter is too thick, you can transfer this to a pot over a low heat, or put it in the microwave for 15 seconds to soften. You can add more water if it's too thick for your liking, too. Assemble your bowl! 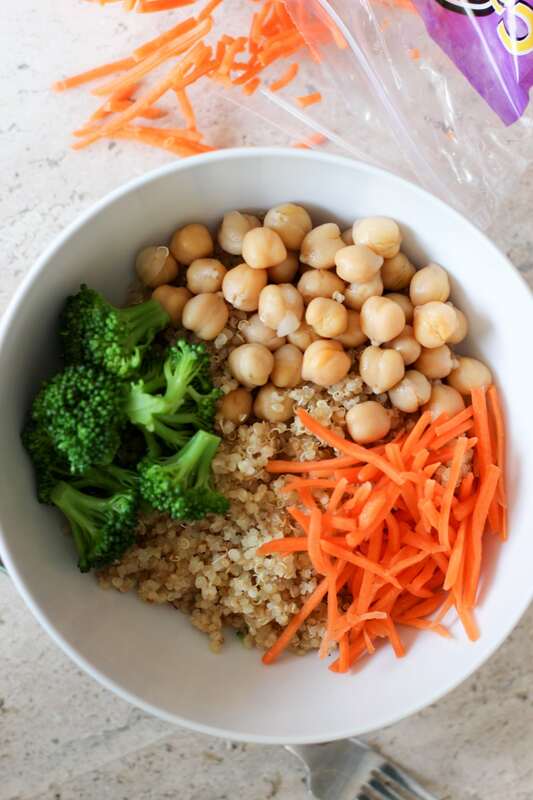 Start with quinoa, and then add carrots, chickpeas and broccoli. 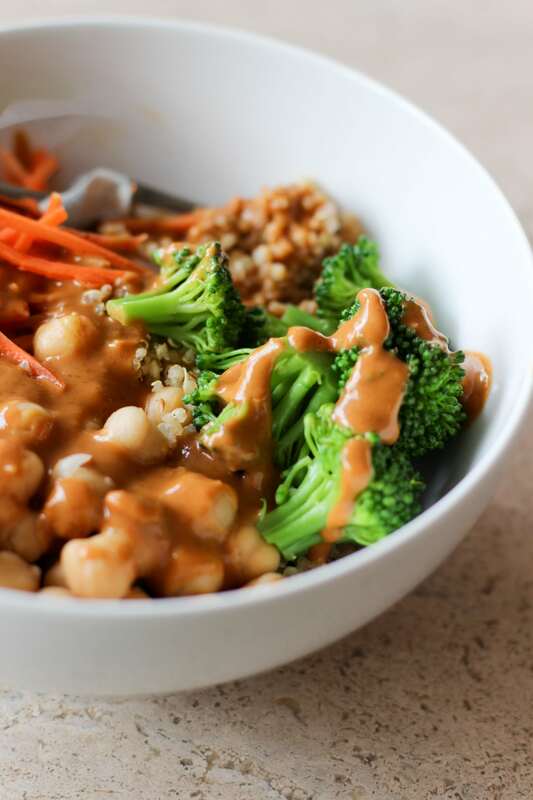 Drizzle the peanut sauce over the top. That's it! 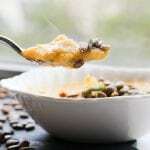 Feel free to use different vegetables, and add chicken, tofu, or another favorite protein to this bowl. I also like to add chopped peanuts on top, too! « My First Macy’s Event! Yum! This looks so easy and seems pretty uncomplicated. Thanks for the recipe, Lauren! Made this tonight and it was great! I am gluten free so I left off the hoisin sauce (not gf free) and used cauliflower rice instead of quinoa. Thanks for the idea!